I have an odd way of celebrating things. When I finished my thesis, I took off to Spain to run a marathon. 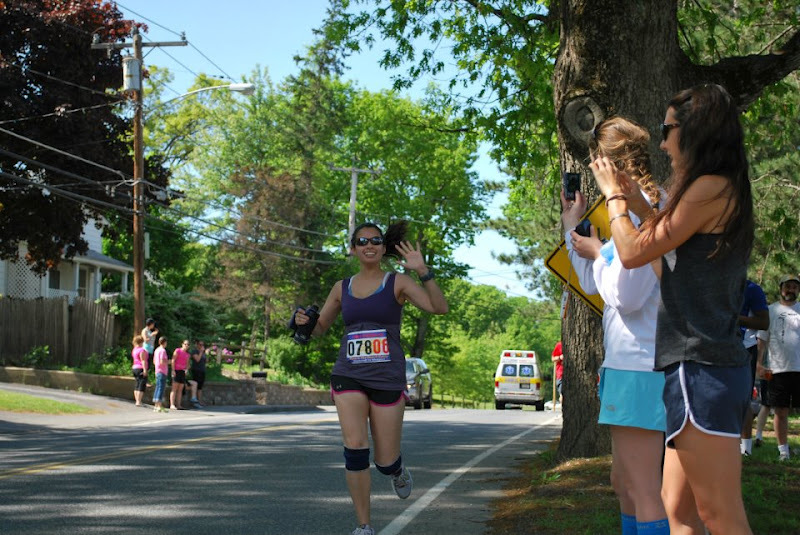 When I graduated with my Masters, I took off to Massachusetts to run a 200 mile relay with a bunch of strangers...kind of. Don't be surprised if when I get my first job post graduate degree, I go off and run an ultra that weekend. I'm kidding. Maybe. 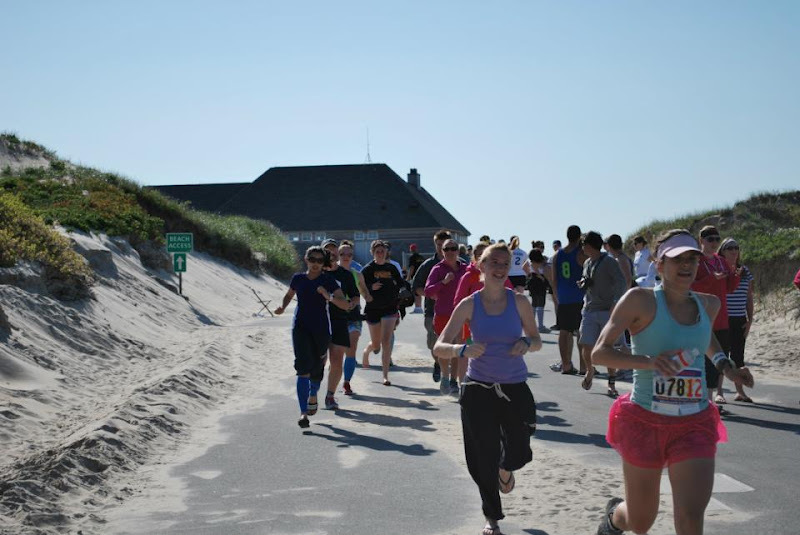 I signed up for Reach the Beach: Massachusetts a few months ago when Sarah tweeted that she was looking for runners to join her team. Soon after, I posted that we were looking for a few more runners to join us and got Emily and Gia to take the bait and run Reach the Beach with us. Thursday morning (I know, I have a whole week to recap you guys on), after a busy morning, I met Emily and Gia at the Bolt Bus stop to bus our way to Boston's South Station, cab our way to Boston's North Station to meet up with one of our teammates, and then train our way to Fitchburg, Massachusetts...which is in the middle of nowhere. Friday morning, Sarah picked us up with her husband, Ruddley and our teammate Eric to head to the start line and start our 200 mile journey. 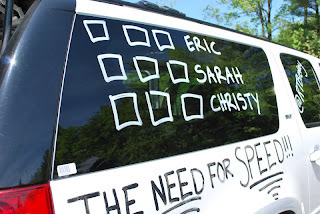 We met up with our teammates in Van 2: Jen, Jill, Carrie, John, Andy and Stacy. 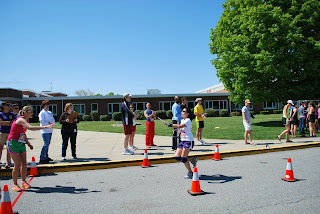 After a brief orientation about learning how not to die on the race course, we sent Ruddley off and hopped into our van to head to Transition #1 and start the race. I was Runner #6 so I had quite a bit of time before heading out for my first leg. 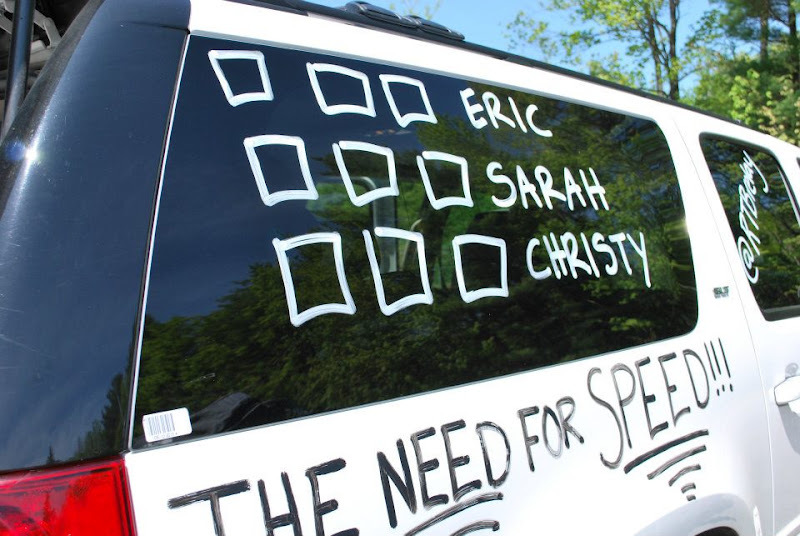 There wasn't much time to decorate our van so we didn't get around to it until Emily headed out for her leg when we had some down time. ...but once I headed out for my first run, I felt awesome! The run was challenging but nothing Central Park or Madrid training hadn't prepped me for. It was listed as 6.71 miles but ended up being around 6.85. It's pretty much impossible to run the tangents when you're running across traffic lanes. 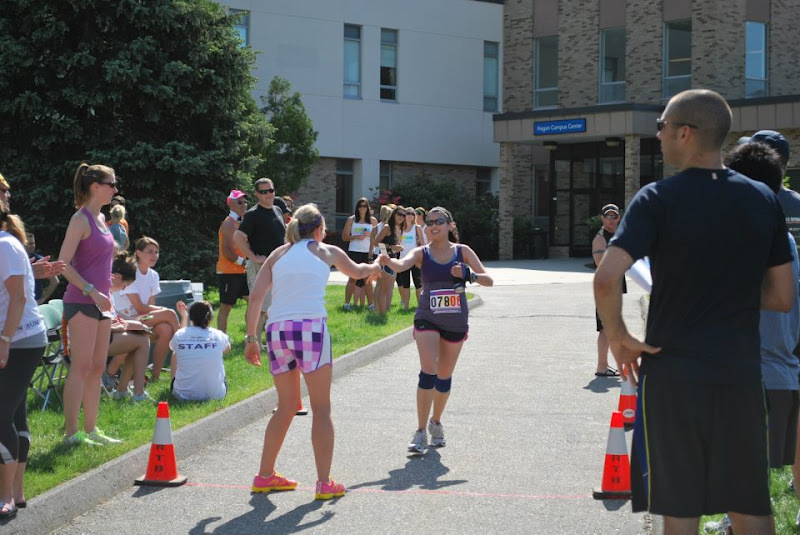 When my watch hit 6.5 and I saw Assumption College, my transition area, I started sprinting...up and up and up and up until finally, I reached transition and handed off to Jill. Feeling strong on Leg #1! 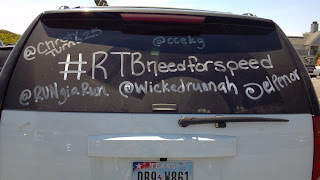 Leg 1 is DONE and Van 2 is OFF! With about 4 hours to kill while Van 2 took over, we went and got some food before heading to the 2nd major transition area and resting up for a bit at Hopkinton State Park. It started getting dark slightly before Ruddley headed out for his second leg and I started getting really nervous about running in the dark. By the time Gia went out for her leg, it was pitch black. I knew I would be starting my 2nd leg somewhere around midnight and had thought about running in the dark but I hadn't thought about running on rural back roads with absolutely nothing around but trees. By the time I headed out for my 2nd leg, I was terrified. Donning my headlamp, reflective vest, and 4 blinky lights, I was lit up like a Christmas Tree but I still couldn't see past the 2 feet in front of me that the head lamp offered. I was trying to run as fast as I could to get the run over with me. When I felt like I had gone about a mile, I looked down at my watch only to find that I had run 0.35 miles...and I started crying. I hated running at night and was just freaking out. I felt completely alone out there. 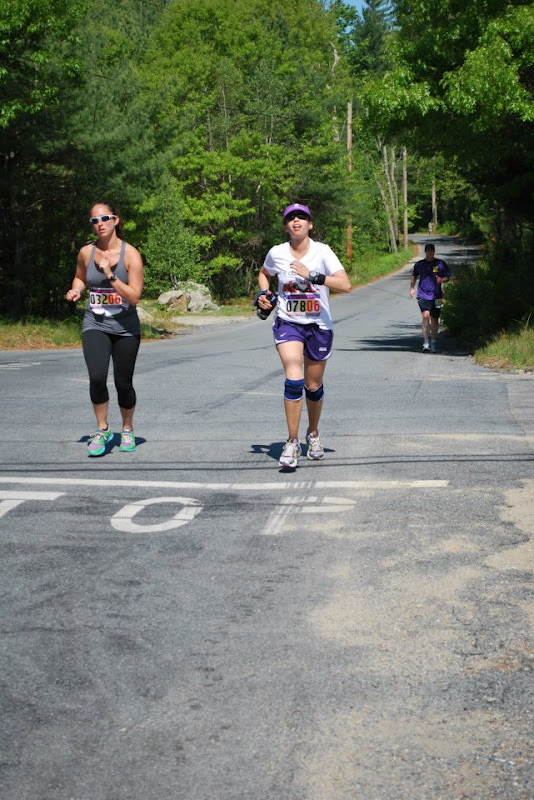 There was one runner ahead of me who I lost pretty early on and through the rest of the leg, I never saw another runner. Just before Mile 1, saw my van and called out to Emily to come join me. About half way through the run, she hopped back into the van and Gia ran me in. 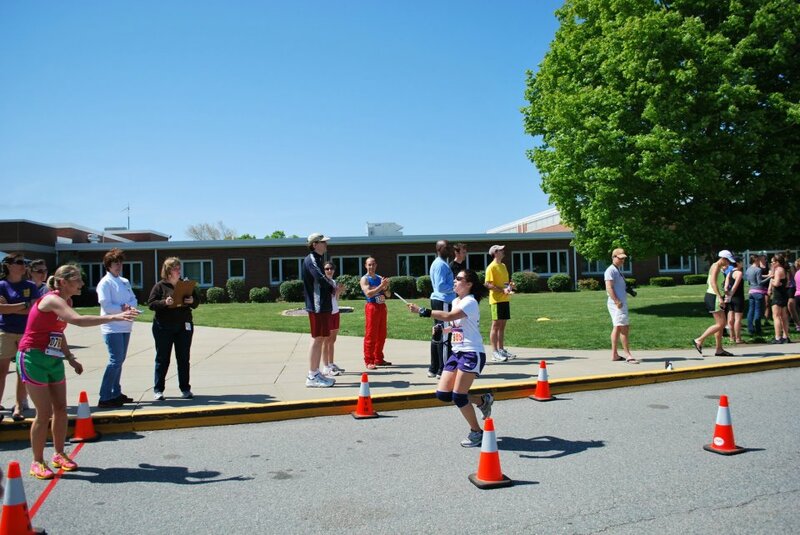 For me, this was the absolute worst part of the relay and the one thing that leaves me hesitant about running another relay. 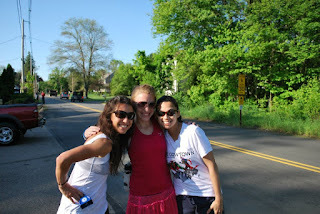 I was so thankful to have such awesome teammates to get me through that leg of the run. When we finished, we headed to our next major transition area and went to sleep. We transitioned around 5:30am and sent Ruddley off on his 3rd and final leg. I slept through his and Gia's legs (sorry guys) and woke up to cheer on Eric, Emily, and Sarah before running my final leg. My final leg was a beast of a run. 6.6 miles on some serious up hills. Holy hell was it tough. 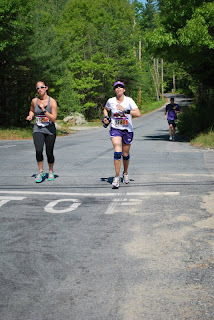 I found a girl who kept me on pace for about half of the run before passing her and finishing strong. That run was tough. My legs felt surprisingly fresh but it was hot out and those hills were brutal. I was trying hard to run hard and fast. I was in a groove and my legs were just moving on autopilot. I couldn't slow down or speed up. I was just going. I passed my teammates at one point and heard Eric say that I looked strong which made me want to run even harder. When I finally made it to transition, I was flying. I wanted so badly to be done...but I felt on top of the world. I had done it. 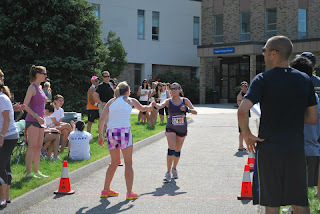 I had finished the hardest leg of the relay...and I had finished strong. 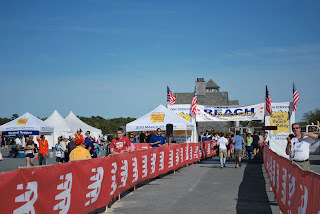 When our 2nd van go to the beach, we eagerly headed to the Finish Line to await Jen, our final runner, and run her in to the Finish...so that we could officially reach the beach as a team. We had done it. 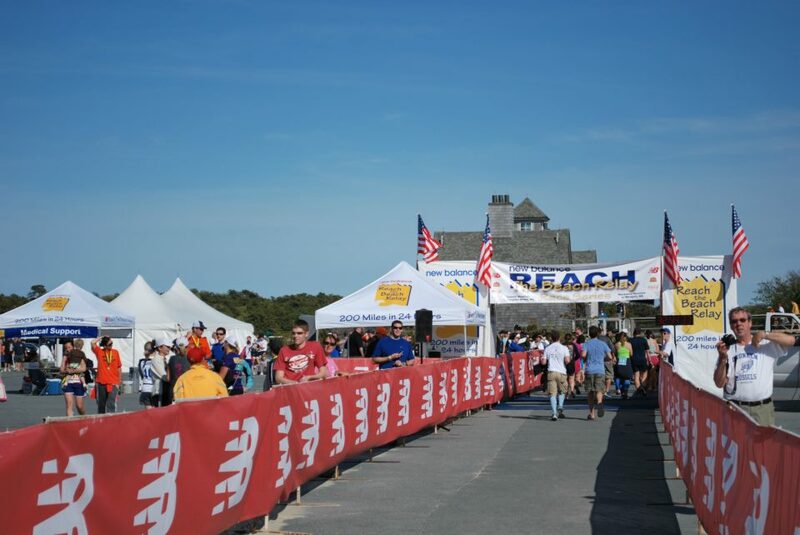 Team Need for Speed finished the Reach the Beach Relay in Massachusetts in 30:04:23 (average pace 8:59). Overall, Relaying was an awesome experience and I was lucky to have such an amazing group of people to run with. A huge thank you goes to Sarah, our Team Captain, for organizing the relay. To anyone not afraid of the dark, I highly recommend running a relay...if I can bribe you to run my night legs, I'll totally join you. I'll be back this week with regular posting including graduation recaps, the answers to your questions for The Pilot and more! Stay tuned! I don't think a day goes by that I'm not constantly asking my boyfriend questions about what it's like to be a pilot, how he handles certain situations in the air and what certain things mean. I've been flying since I was about 3 years old, flying by myself since roughly age 8 and, well, as you all know, I can't seem to get my head out of the clouds...literally. On one of our very first dates, The Pilot took me flying over the skies of Daytona Beach on one of his flight lessons just before he graduated. 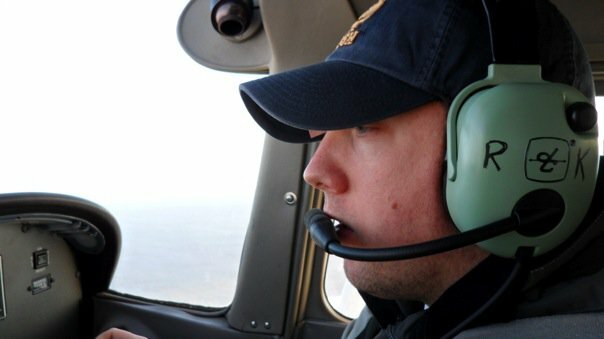 Since then, we've taken to the skies for quite a few dates, a few of which he let me pilot the plane myself! (See picture in my blog header). Part of me wonders if I could do it all over again, if I would have become a pilot. Since flying with him though, I definitely have the desire to one day get my private pilot's license because hey, flying is a lot of fun! When I tell people that my boyfriend is a pilot, they usually bombard me with questions, many of which I can't answer, so I've decided to give all of you the opportunity to Ask the Pilot! Have you ever wondered what makes a plane fly? Just what causes turbulence? What kind of schedule pilots work? What kind of routes they fly? The pilot has kindly agreed to answer any and all questions you have about all things aviation...or anything else for that matter. So, ask away! Leave any questions you have in the comments and I'll have The Pilot answer them in a post! This weekend, Andrea asked me when the last time that I really went out and had fun in New York was. You can thank my thesis for that. But that all changed this weekend when Andrea and one of her friends from her home town of Milwaukee (apparently pronounced Mwaukee) came to New York and crashed with me for the weekend. It was Andrea's first time and Ange's first since she was 12 or something, so we needed to do things the right way. 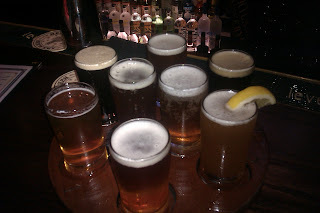 They came in on Friday night and wandered around Union Square until I got off work after which, we went to The Heartland Brewery and each ordered samplers of beer. From there, we made our way to City Hall Park and walked across the Brooklyn Bridge so that we could eat pizza at Grimaldi's. God, I love Grimaldi's pizza. 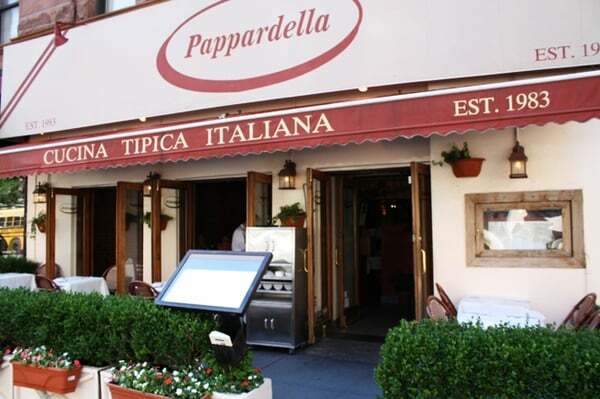 Best pizza in New York...hands down. We took the subway back into Manhattan and came back to my apartment to watch a movie and call it a night. I introduced them to "Angus, Thongs and Perfect Snogging," Nickelodeon's make of one of my favorite YA book series, The Confessions of Georgia Nicholson...which is essentially a British version of Mean Girls and The Princess Diaries. Saturday morning, we were up bright and early to head to Central Park for a run...only it was cold, gloomy and rainy out so we bailed and made our way up town to get waffles from my favorite waffle truck, and walk down 5th Avenue to see Tiffany's and 30 Rock. We made our way into Times Square and then hopped on the 7 train to CitiField for the Mets game! Andrea got us awesome seats and the METS WON! 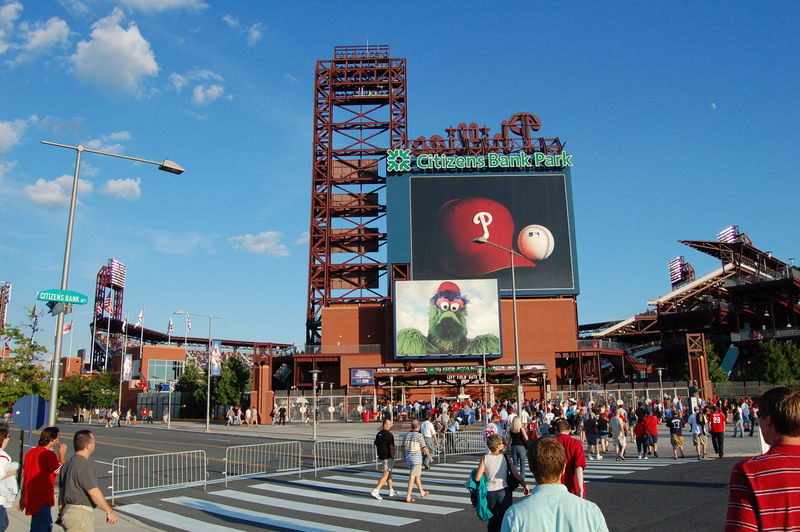 It was a great game which was a refreshing change from the last Mets game I went to which lasted 4 hours during which absolutely nothing exciting or interesting happened. This morning, we were up bright and early to get in our Central Park run. It was one of Ange's "must do" things, so I took them for a tour of Central Park. We started at Engineer's Gate, popped onto the Reservoir and jumped out on the West Side before heading south, looping the bottom of the park and then ducking into the Mall, running down to Navy Terrace, back out the Mall and up Cat Hill to finish back where we started. All in all, it was a fantastic weekend. Now, I'm watching Miss Congeniality and trying to decide what to do with myself on my first Sunday in about 6 months with no school work to do because hey...guess what? I finished my Master's degree and I won't have school work to do again for a long, long time. Hello Blog Readers! If you don't follow me on Twitter, you missed out on the fact that I went to San Francisco this weekend. Oops. Full details on that to come later this week. 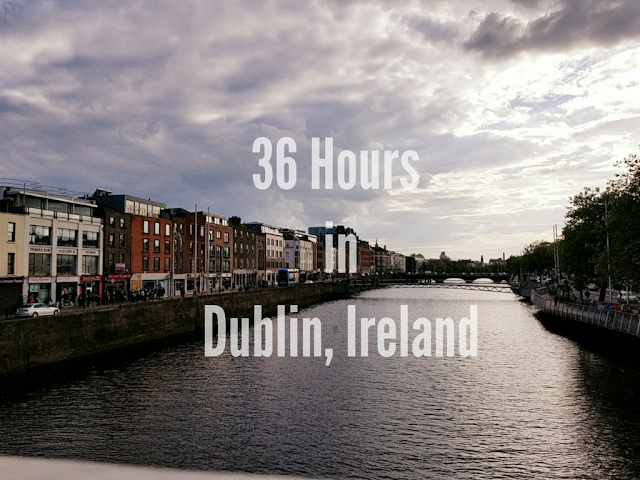 Now that I'm back stateside and on the East Coast, it's time to do a little recapping of my Madrid adventures. It's crazy to think that I was in Madrid only a week ago because it already feels like a month ago. Jetting off to the West Coast less than 48 hours upon landing back in the US will do that to you. So let's talk about Madrid. My mom and I flew out of New York on Wednesday night and landed in Spain early Thursday morning. Super jet lagged, we checked into our hotel and passed out before meeting up with Ally and her sister to explore the city a bit. I had read that the best place to start a trip to Madrid is in the Puerta del Sol so we ventured there to get our bearings, do some shopping and wander around the city. Friday morning, Mom and I headed to the Expo to pick up my race packet. From there, we went out to explore the city some more and just kind of let ourselves get lost meandering through the city. We found the Palacio Real and explored the Santa Maria la Real de Almudena.We went to the Plaza Mayor and had a delicious tapas dinner at a restaurant on one of the side streets off the Plaza. We stumbled on the Mercado de San Miguel and found the after work crowd coming out to play. 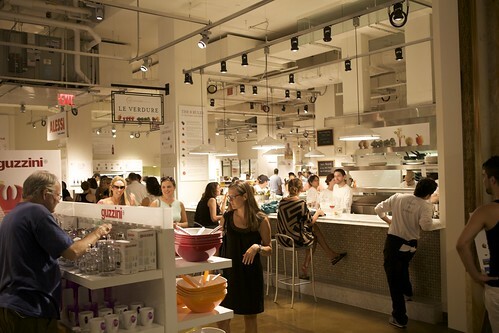 The Mercado was absolutely incredible and my mom said that she would go back to Madrid just to go back to that market. We explored for what seemed like hours before heading back to our hotel and calling it a night. Saturday was a shopping day! I bought a gorgeous dress for graduation and some unbelievably cute shoes for ridiculously cheap. For dinner, Mom, Ally, Rachel and I headed to the top floor of El Corte Ingles, Spain's premier department store, for a carbo loading session before calling it a night. Sunday...well, you already know about Sunday. 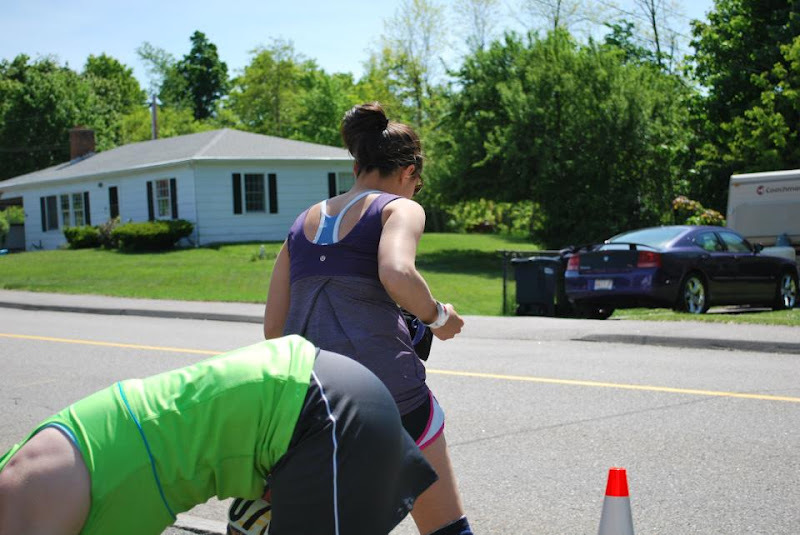 Post-race, I passed out. I have never fallen asleep post-race...I don't nap. Ever. The fact that I slept for nearly 3 hours after crossing the finish at Madrid was further proof that I was absolutely spent going into that marathon and that maintaining the pace I did until Mile 20 was a miracle in itself. We all went for a post-race celebratory dinner that night and went to bed. I didn't sleep well at all on Sunday. My body was more sore than it had ever been post-race and I ended up sleeping until almost 12:00. Getting out of bed and starting my day was brutal but somehow I managed and my mom and I headed to the Museo de la Reina Sofia to go see the famed Guernica painting, which I did a project on in college. We meandered around the museum and then stopped in the museum's square for lunch. There were a few things that I had seen along the race course that I wanted to see up close so we did that before calling it a day. Dinner was early and close to the hotel as Mom and I had an early flight out the next morning and Ally and Rachel, an early train. Tuesday morning, I left Madrid and hadn't even returned to my New York apartment before I was on a West Coast bound plane...but you can read all about that later. I loved Madrid. If you're looking for a European vacation, I highly recommend Madrid. I had heard that people typically love either Madrid or Barcelona and hate the other and having been to Barcelona and not liking it at all, I can attest to that statement. I had so much fun in Madrid and it was the first time in ages that my mom and I got to go on a nice long vacation together. Madrid was unlike any city in Europe I had ever been. It had the charm of Paris, the down-to-earth feel of Prague, the history of Rome...it had a little bit of everything that made it both similar and unique to all of the other cities I had been. I absolutely loved it. The people were wonderful. The food - spectacular. I'll definitely be back...but next time, it won't be for a marathon.